Yin is becoming an increasingly popular practice in a yoga world of predominantly yang styles. Yin yoga provides a great compliment to its more dynamic, movement and strength focused Yang sibling. This is why I have decided to offer you 5 restorative yin yoga poses. As the name suggests, Yin yoga is a quieter, more introspective practice, which consists of floor-based postures held for a longer duration. Whereas Yang practices focus more on movement and muscular contraction, Yin targets the connective tissues in order to stretch and rehabilitate them. Our connective tissue slowly shortens and contracts as we get older, suffer injuries, or perhaps just neglect it, this is turn has a negative effect on our joints. 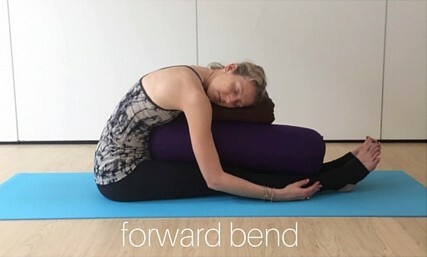 Restorative Yin yoga poses are done with the muscles relaxed and for longer holds; placing moderate stress on the connective tissues to enable them to stretch and release. Here are five of my favourite restorative yin yoga poses. If you decide to practice these at home I recommend using a timer so that you know how long you have been in the posture (and don’t have to keep checking your watch every ten seconds too!) Yin teacher Sarah Powers recommends three stages to restorative yin yoga poses – coming into the posture to the appropriate edge – a place where you can feel sensation but are not overwhelmed by it; becoming still with the muscles relaxed and willing to let go physically and mentally, and finally holding the pose. Find yourself a quiet space and enjoy! Lie on your back in a star shape – moving the arms and legs out to the side to wherever is comfortable for you. Close your eyes, get comfortable, and allow yourself to relax down into the mat. I like to use this pose at the start of my practice to get quiet enough to be able to tap into the sensations of the body and make a shift to a more ‘yin’ state of mind. I often do a body scan here too – slowly and carefully scanning my attention all around my body noticing any areas of tension or holding on. As you do this notice the areas the awareness skips over, and go back and feel into what is happening in this spot. Remember that how your body feels today is different from yesterday, last week, even than when you first got up this morning! Take this quiet time to also check in with your emotional tone, and whatever might be going on in the mind – be it busy or quiet. Don’t allow yourself to get attached, but make this a practice of observing and feeling without judgment; simply noticing and holding space for whatever is. 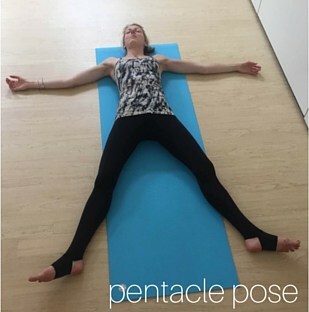 You can also use pentacle to rest between postures or at the end of your practice too. Hold for up to five minutes. Sit on your mat with the weight evenly placed though both seat bones. Bring the soles of your feet together and allow the knees to relax out to the sides. Your legs will form a diamond shape. If hips are tight move the feet a little further forward. Fold forward from the hips until you feel a stretch through the inner groin, outer hips and back. The head can rest on your hands, or on a bolster. If you have disc injuries or low back issues sit on a folded blanket to elevate you a little and stay sitting upright – if you have use of a bolster use it at its highest height to rest your head on. For very tight hips having bricks under the outer edges of the knees can help take some of the pressure off in this posture too. Hold for three to five minutes. As you come out, use one hand to help lift the head up, and both hands under the knees to draw them back together. Sphinx is a passive backbend that stimulates the kidney meridian which travels through the sacro-lumbar area of the lower spine. Stimulating the kidney chi helps us feel more revitalised and energetic. Lie on your tummy and bring the elbows an inch of two in front of your shoulders and have them shoulder-width apart. Bring your palms together and hold here. Avoid slumping down into the shoulders or pushing up from them too much. Let your belly drape down towards the floor, and the buttocks relax. Pinching in the low back is not a desired sensation in this posture – in this case move the elbows further forward so the ribs can rest down on the mat too. If your back feels aggravated then come out of the posture. Lying with a blanket under the pubic bone takes some of the pressure off this area and can make the shape feel more comfortable. Hold for three minutes and then lower down to rest on the belly. Notice the subtle shifts you feel in the body as you rest here for a few moments. Bring the right knee forward so that it is in line with the hip and the front shin is parallel to the front of the mat. Use padding as necessary under the right buttock, and make sure the left hip faces down to the floor. Fold forward and rest your hands on the floor or come down onto forearms. Using a bolster here can be supportive too. If you have any pressure or discomfort in the knees then come out and use eye of the needle pose instead. Hold sleeping swan for three to five minutes and then change sides. This pose is great for stretching the muscles and connective tissue on the outer side of the hip and buttocks and stimulates the gallbladder and liver meridians. As a runner this posture is one of my favourites as part of my post run yoga sequence! This posture stretches out the backs of the legs, the spine and stimulates the bladder meridian. It also helps to relax the mind and focus our attention inwards. Stretch the legs straight out in front of you, sitting on some padding to elevate the sit bones if you have low back problems or very tight hamstrings. Folding from the hips, bend forwards, allowing the spine to curve. Use a bolster to rest the torso on for extra support. If you have sciatica or back pain, bend the legs and place the feet flat on the floor (you can use a bolster under the knees for extra support if one is available), this will help you to bend forward from the hips without pulling the low back. Hold this pose for three to five minutes then slowly lift up. Restorative Yin yoga poses are a great compliment to a Yang practice, and is especially good for those who struggle to be still and relax. As with any yoga practice make sure you are honour your body’s needs and please check with a doctor, healthcare practitioner if you are unsure if this is a suitable practice for you. If you are pregnant work with a yin yoga teacher so you can receive the appropriate modifications necessary for you at this special time. 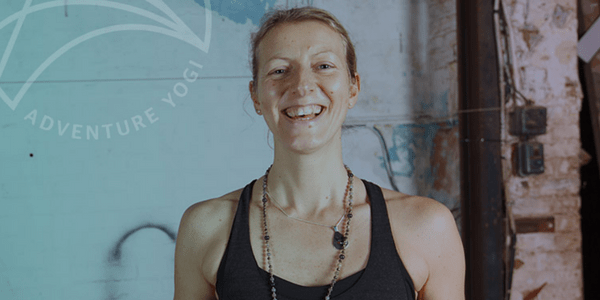 Rosalind Southward is a yoga teacher and Forrest yoga expert based in Peterborough. She teaches inspirational, playful, powerful classes with a sprinkling of quirkiness that you won’t forget! See Rosalind’s upcoming retreats here. 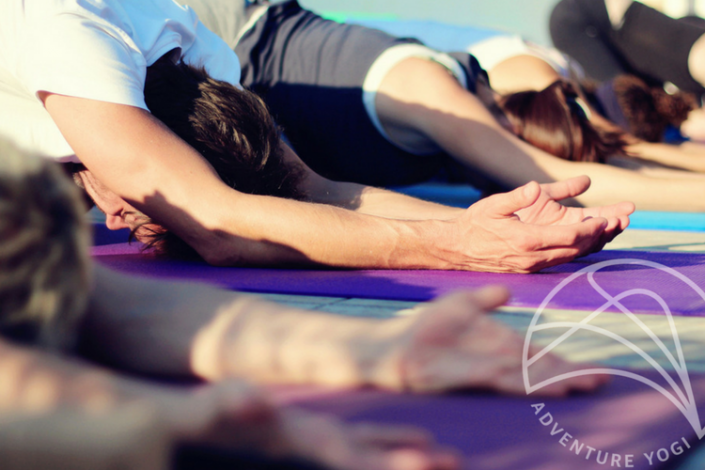 We work with many yoga teachers who incorporate restorative yin yoga poses into their classes – visit our calendar page to see what UK Retreats and Yoga Holidays abroad we have on offer.